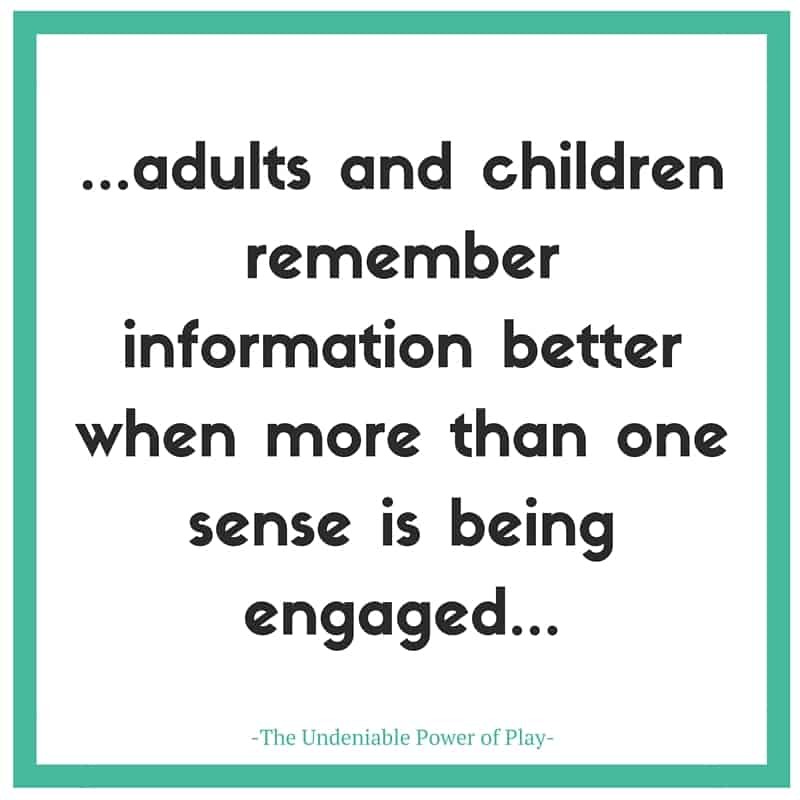 One of the comments I get the most when talking about sensory play, arts & crafts and science for kids, is “but my baby still puts everything in his/her mouth“. As our babies get older, but aren’t quite ‘big’ kids yet, it becomes increasingly difficult to keep them occupied, finding activities that are safe for them to engage in. 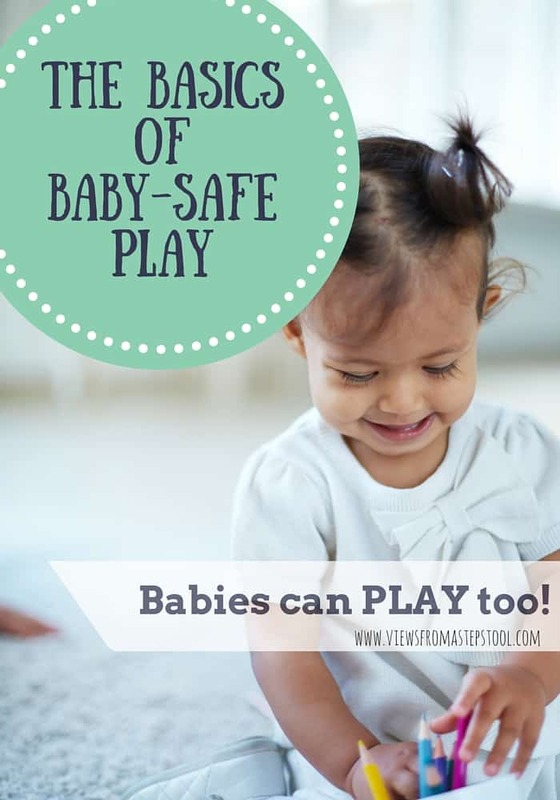 By turning your normal activities into baby safe play, you will be able to do more with a wide range of children, adapting the activity and allowing it to grow with them. 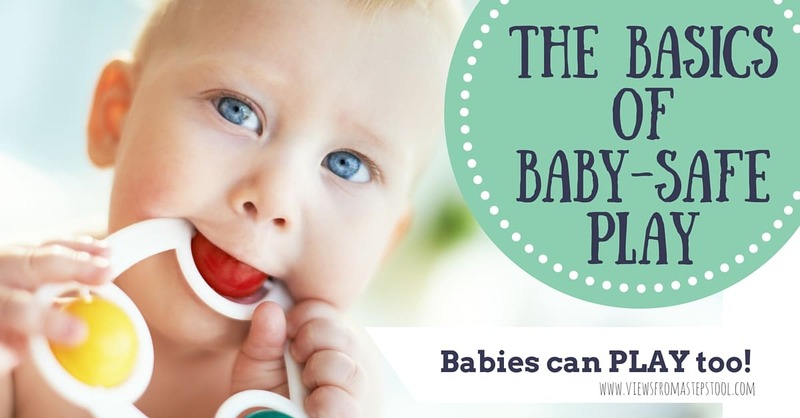 The Basics of Baby Safe Play. Babies (and toddlers) can play too! Baby safe play is edible. By making your materials edible, you are eliminating the risk of your little one ingesting any chemicals, and depending on the choice of materials, you are reducing the risk of choking. If the thought of taking perfectly good food, wasting it for play, and throwing it away bothers you, you are not alone. I try to think carefully about my choices when using food for sensory play, and at the very least, I try to get another use out of it. For example, when playing with colored pasta or pudding, I actually expect that a lot of it will get eaten (maybe it’s just my kids) but if I know it will be eaten, to me it’s just another form of delivering a meal or a snack. Baby safe play is homemade. I don’t know about you, but I trust my kitchen more than just about anywhere else when it comes to what my baby eats. Did you know that a lot of the items that you would use for traditional kids activities can be made at home? And pretty simply at that! Play dough, oobleck, and paint are a few that have very simple ingredients and that are excellent to whip up for all kinds of play with your kids. Play dough and oobleck are fantastic for sensory play, and when homemade from pantry items, your mouthing kids will be more than safe to play with these items! There are a ton of homemade play dough recipes, but my favorite is non-cook and straightforward. This is a mixture of water and cornstarch that is awesome for sensory play. Make it in a bowl, pour it on the high chair tray…or get adventurous and add a shallow bit of water to a wading pool or bathtub and add cornstarch until the mixture gets goopy. Add food coloring for more fun! Baby safe play can include arts and crafts! Your baby might chew on crayons or a glue stick and so you might be thinking that arts and crafts are off the table…there are a couple of options for you! Make the homemade paint (above) and give your baby a large paintbrush and tape some paper onto the high chair tray. You can also forgo the paintbrushes all together! Plop some of the homemade paint onto the paper and give your baby a ball to roll through it, a truck to drive in it, or let them use their fingers! You can also use yogurt, pudding or baby food as fun (and tasty) finger paint! Squirt some paint into a ziplock bag with a piece of heavyweight paper inside and tape the bag to the table. Let your baby ‘draw’ with their finger through the bag, not only is this safe but it’s also MESS-FREE. Make some outdoor sidewalk paint by adding some cornstarch to colored water, this is a great alternative for babies who chew on sidewalk chalk. Lastly, tape some contact paper sticky-side up to a table and let your baby affix large pieces of paper, tissue paper, lightweight toys, etc. Baby safe play can ALSO include science!! So much of what you already do with your baby is science! Play outside with bubbles and let your baby observe what happens when you touch a bubble. Let your little one help in the kitchen by banging on pots and pans with a spoon, try different spoons and watch them observe the sounds all while experiencing cause and effect. Go for a walk with your baby in the stroller and show them leaves, allowing them to crush them in their hands or hold a pinecone. Science really is all around us. For a baby-safe experiment. Place some baking soda on a tray and whip up some colored vinegar. Slowly pour it on the baking soda and let your baby watch the reaction. Let them explore it with their hands or let them pour the vinegar themselves if they are able to. Make a wave in a bottle! This sensory bottle includes oil and water and makes the perfect mess-free introduction to science AND sensory play! Baby safe play is fun! Let your child take the lead. 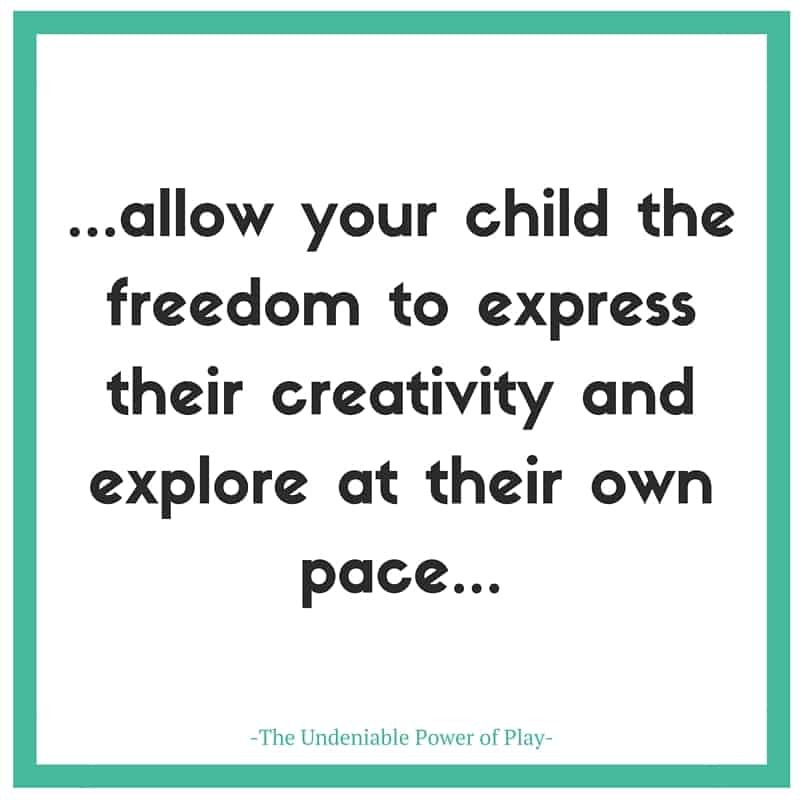 Watch them explore, prompt them with questions and give them ideas, but let them be the boss of their own play. You will be amazed at what you see. Want more ideas and inspiration? 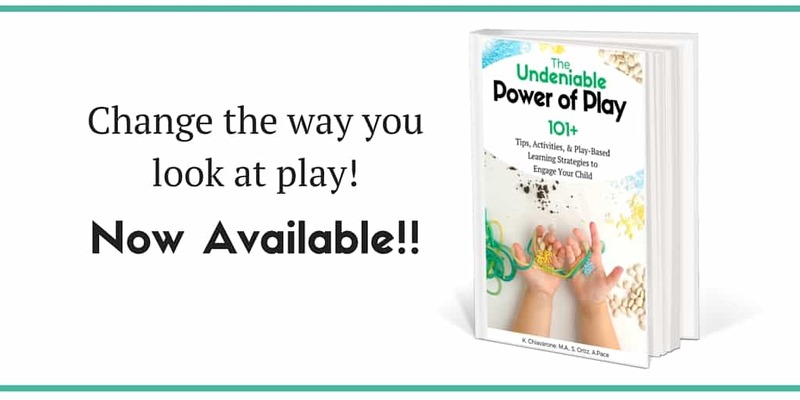 Check out our eBook, The Undeniable Power of Play, it gives even more ideas for activities that can be easily adapted to be made baby-safe. Have fun!